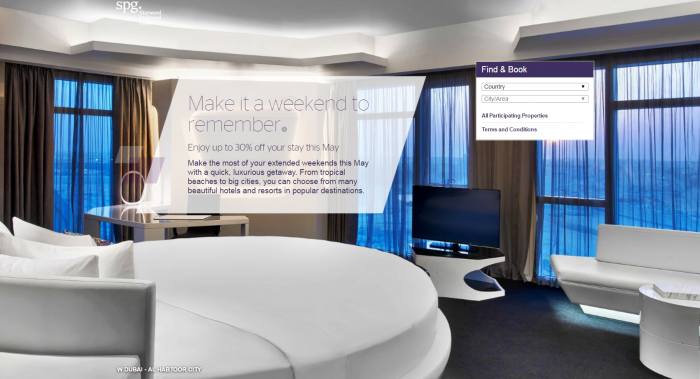 Starwood has launched a new up to 30% off sale for stays at participating hotels in Middle East. The offer is valid for stays consumed between April 24 – May 29, 2017, when booked April 10 – May 20. The Ramadan is starting at the end of May that should affect the hotel occupancy rates in the region. There should be deals around at that time when the occupancy rates plummet. Offer is valid for stays booked between April 10 and May 20, 2017 for stays between April 24 throughout May 29, 2017. Terms and conditions specific to each offer may apply. Cancellation restrictions and deposit policy may apply. Minimum lengths of stay restrictions may apply. Fully prepaid rate, non-refundable; advance deposit is required. No cancellations or modifications allowed. Offer is valid at participating Starwood Hotels & Resorts in Europe, Africa and the Middle East. Package includes 50% off of 2nd room, for kids up to 21yrs. If different room types are booked the discount is valid on the lower type. Book double occupancy if 2 or more sharing. The discount will be applied at check in for the second room. Kids up to 12yrs eat for free from kid’s menu when accompanied by a dining adult. Adults must order from buffet-regular menu. Maximum 1 child per dining adult. A limited number of rooms may be available at these rates. Blackout dates and other restrictions may apply. Offer not applicable on groups. 3,000 Starpoints will be awarded per paid eligible stay on rate code STE0PT or STE1PT and will be awarded for room revenue only. Starpoints earned on other eligible charges will not be bonused. 3,000 Starpoints per stay per stay will be credited to the member’s account within 4-6 weeks of the stay posting to the member’s Starwood Preferred Guest account. Multiple rooms charged to the same member during the same stay will only count as one stay. Offer includes daily complimentary breakfast. All promotions associated with Starwood Preferred Guest® are subject to the general terms and conditions of the Starwood Preferred Guest program, which are subject to change without notice. Full terms and conditions of the Starwood Preferred Guest program are found at www.spg.com. Breakfast package – Includes daily breakfast for 2 in restaurant. Breakfast for 2 in restaurant as defined by each property. Room service will be excluded from this offer and charged in full if consumed. Please speak with the Front Office before ordering. Any dining credit provided by the hotel is valid only in hotel outlets and excludes any third party operated outlets. Credits must be used during your stay and cannot be refunded on check out if not utilized.